If Nonsense Is Beauty, Is Beauty Nonsense? Keetra Dean Dixon specializes in impossible symmetrical objects: a cigarette with two filters, one at each end (Every Breath You Take); a balloon with two openings (Dubloon). Peter Iannarelli offers a similar concept: two hammers joined at the "face." (The face is the part of the hammer you hit the nail with.) Steve Rossi's "Reciprocal Ladder to Roll" is a circular red ladder, seen feet in diameter, designed to be rolled down the street. All these self-contradictory objects appear in "Beautiful Nonsense," a show at the Rockland Center for the Arts in West Nyack starting February 13. The artworks tend to fall into two categories: the rural and the urban. The rural are often homemade. 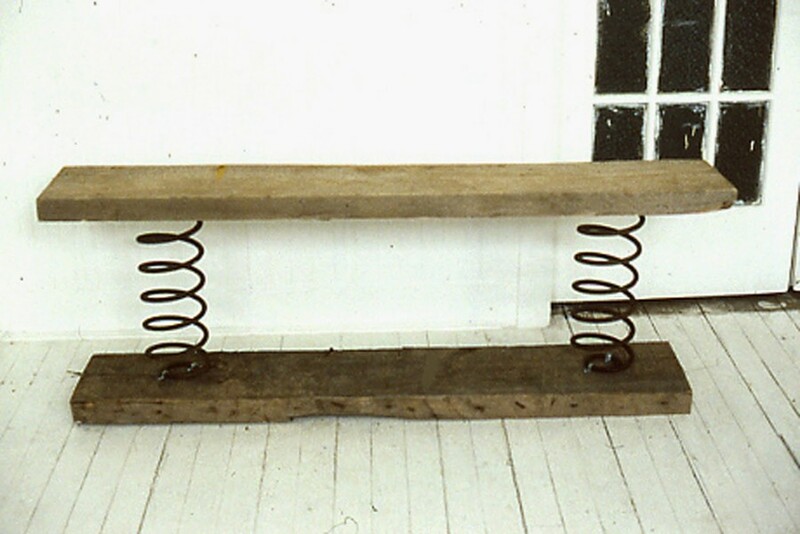 Paul McMahon's Bouncy Bench consists of a plank of wood supported by two coiled springs. 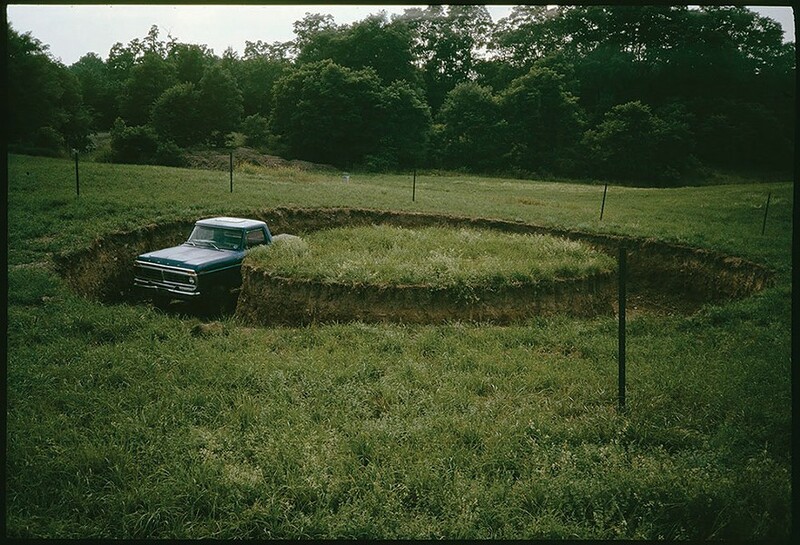 Driving Around is Jared Handelsman's puzzling photograph of a pickup truck caught in a circular trench. In fact, Handelesman dug the trench himself with a backhoe, and dropped in the truck. The "urban" items, on the other hand, look like they were fabricated in a factory. Katerina Kamprani, a designer in Greece, produces sleek, anonymous pieces—a green coffee cup with a horizontal handle, a fork with one-inch-thick tines—that resemble impersonal riddles. Some of the works show immense technical skill, such as Livia Marin's melted teapot, from her "Broken Things" series. Half of the pot has become a puddle, still imprinted with its blue Chinese-style pattern. Myra Mimlitsch-Gray's spoon with an extended handle—a spoon that has been stretched like taffy—may be quoting my favorite Salvador Dali painting, Agnostic Symbol, which shows a 20-foot-long spoon reaching toward a mysterious stone, then bending around it. "Beautiful Nonsense" is often funny. The artworks function the way a joke does: the setup, then the punchline. There is an affinity to pranks, like the ones advertised in comic books in the 1960s: pepper chewing gum, the "joy buzzer," whopee cushions. These pieces reach to the heart of the question, "What is art?" The answer: art is a fork you can't eat with. 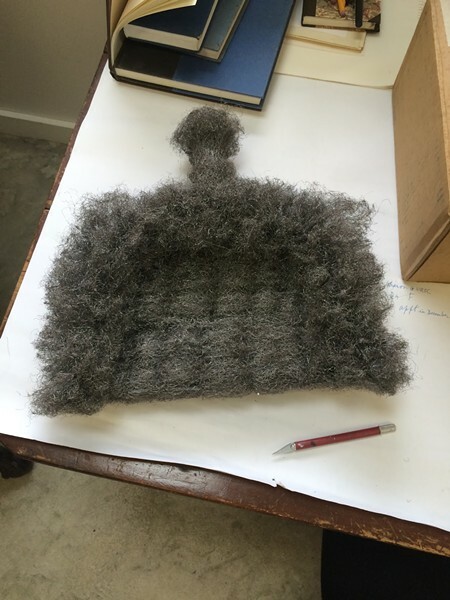 The absurd object is most closely associated with Dadaism, the anarchistic art movement which began in Zürich in 1917. But Dada must be updated from time to time. To begin with, the state-of-the-art absurdities of the 1920s look quaint and grandmotherly today. Most of the artists represented here are from the Hudson Valley, but a number are international. Sculptors from Spain, England, Greece, Brazil, and Germany are represented. Absurdism, it turns out, is a universal language. The show began with an idea. The curator, artist Norm Magnusson, explains, "I was thinking of moments in our lives when you are taken out of our perceptual surefootedness, when you wake up in a strange bed in a strange town and for a second don't know where you are." Magnusson is best known for his faux history markers, which often include subtle political satire. 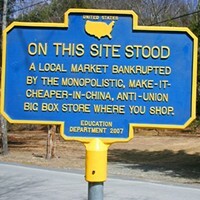 Many of these signs appear in the Hudson Valley. The absurd object can have a political dimension. "Joy Taylor did a piece that's one of my favorites: a dustpan made out of steel wool," observes Magnusson "For me, it's a home run, because it first takes you out of your ordinary relationship to ordinary objects, and then interjects this other commentary, which is the abrasiveness of domestic life for a woman." 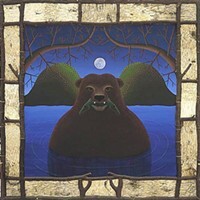 The Rockland Center for the Arts is also showing "Winter Theorems," a collection of fanciful mixed-media drawings by Kingston artist Kevin Paulsen, many of them on "foxed" paper (i.e. paper dipped in tea).